icefall regent and flicker effects. Also you can do peregrine drake with Deadeye Navigator for infinite mana. however you can use deadeye navigator with Cloud of Faeries for infinite loop as well to get Altar of the Brood to infinite mill your opponent. 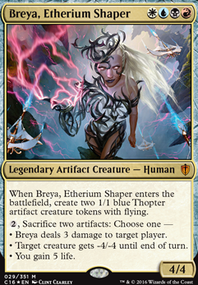 also have you considered Felidar Guardian and Liliana, Death's Majesty with Blasting Station ? ya can get infinite damage in on your opponent. Jijim on Why don't you play 2 decks? Like mentioned earlier, Emrakul has protection from spells but not from abilities. Flickerwisp , Aether Spellbomb , Oblivion Ring , Detention Sphere , Deputy of Detention , Reflector Mage and a lot more have triggered abilities. The disruptive ability is on the stack after the spell is cast. Emrakul is not save from these. We are playing a rather slow game with this deck so it's not unlikely that our opponent sacrifices six permanents to Emrakul and still has enough resources to cast one of these disruptive effects. In fact it happend a lot to me in games against Death and Taxes ( Flickerwisp , Eldrazi Displacer at instant speed before attacking -> no annilator trigger) and Humans ( Reflector Mage ). 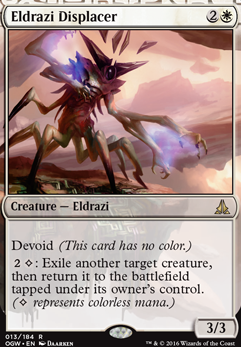 Also Polymorph puts Emrakul onto the battlefield so you don't cast it and don't get the extra turn. 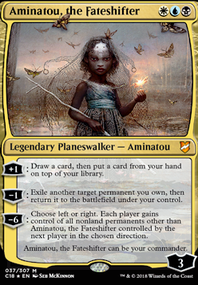 Sure Emrakul is the stronger choise with the annilator ability but objectively Progenitus has more protection and evasion and is a saver pick for a 2 turn clock. This said I still play with Emrakul at the moment. All are pretty much value cards that are super abuseable with Brago, and as RecklessN7 mentioned as well. The parallax cards are a hell of a good enchantment to run as well and I would consider them as well! I'd say those three are too slow in general, but Felhide Spiritbinder is okay enough if you're not playing too competitively. 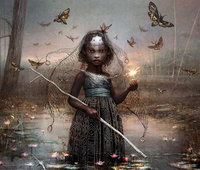 In the competitive Modern scene, Aether Vial is used in Merfolk, Death and Taxes, Humans, Spirits, and sometimes GW. 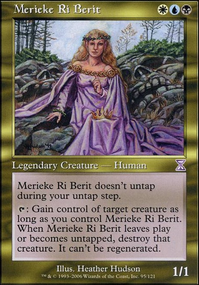 I don't think I'd say it's commonly used (as in not every creature deck plays it), but it's definitely a really good card and quite sought after. It's not worth buying a set for your minotaur deck. Vial works best in aggro decks with a high density of 2 cmc creatures, if it were to be put in a deck with more 3 cmc creatures it would be a slower midrangey/tempo type like Spirits or GW (the type of deck that plays Flickerwisp , Blade Splicer , Kitchen Finks , Eldrazi Displacer ) since Vial makes so much free value. 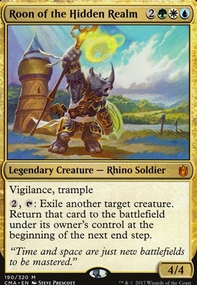 Minotaurs has a tendency to go on the higher cmc side of things, but it's an aggro deck that does not tend to go for the value plan which makes it kind of weird with Aether Vial. Also, I'd say Heartless Summoning is even faster than Aether Vial in minotaurs because of Ragemonger ... You can potentially drop your entire hand on turn 3 with a Heartless Summoning T2-->Ragemonger next turn, whereas with Aether Vial you'd have to wait until turn 4 before you could start cheating in 3 cmc creatures.